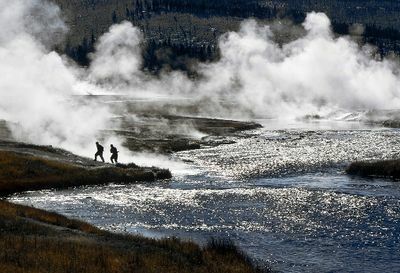 Geothermal springs along Yellowstone National Park’s Firehole River in the cool air of autumn. The world’s most environmentally sensitive geothermal features are protected by law. Geothermal Exploration searches the earth’s subsurface for geothermal resources that can be extracted for the purpose of electricity generation. A geothermal resource is as commonly a volume of hot rock and water, but in the case of EGS, is simply hot rock. Geothermal exploration programs utilize a variety of techniques to identify geothermal reservoirs as well as information that can point to areas of low density, high porosity, high permeability, and subsurface fault lines that can help define well field development. Geothermal exploration is commonly separated into phases - a set of techniques that the developer will use to determine if a location is worth investigating further. Many geothermal developers define phases based on economic considerations and permitting requirements. Typically a developer will perform the least expensive techniques earlier on in the exploration program to reduce the risk of drilling a well with inadequate temperatures or flow. For example many developers will start with a desktop analysis, which includes a review of existing exploration techniques, a site visit, and in some cases inexpensive remote sensing techniques. If that set of techniques shows favorable conditions the developer will move on to the next phase. It is not uncommon for developers to start exploration at 5-10 locations and only drill at 1 location. Note: The exploration phases described here should not be confused with the GEA Development Phases. The GEA Development Phases are used for reporting which stage in development a power plant is in (i.e. Procurement, Exploration, Permitting, Construction). At a workshop in March 2013, IFC (International Finance Corporation), a member of the Word Bank Group, together with the International Geothermal Association launched “Geothermal Exploration Best Practices: A Guide to Resource Data Collection, Analysis, and Presentation for Geothermal Projects” in Istanbul, Turkey. This Best Practice Guide for Geothermal Exploration was produced for IFC by GeothermEx, Inc. and outlines procedures and exploration techniques for geothermal projects and provides guidelines for presenting a geothermal project to funding entities and insurance companies. A focus is placed on high temperature geothermal resources for electricity generation. Project focus is also to attract potential investors by mitigating the associated risks with the help of insurance companies. GeothermEx (International Finance Corporation (IFC)). 2013. Geothermal Exploration Best Practices: A Guide to Resource Data Collection, Analysis and Presentation for Geothermal Projects. Bochum, Germany: International Geothermal Association. Colin Harvey, Graeme Beardsmore, Inga Moeck, Horst Rüter, Stefan Bauer (International Geothermal Association). 2014. Best Practices Guide for Geothermal Exploration. 2nd Edition. Bochum, Germany: International Finance Corporation (IFC). The costs of exploration and the time required to complete an exploration program both add to the risk associated with the development of geothermal power plants. A typical geothermal exploration program for an individual location may require a financial commitment of 7 Million USD prior to drilling the first exploration hole. The time required to bring a geothermal power plant online in many cases is at least 3-5 years with the majority of that time due to exploration. In the case of Glass Mountain KGRA in Northern California the permitting delays were significant enough that it took over 20 years to complete an exploration program. A representation of the cost and time commitments required for a typical geothermal exploration program can be viewed and modified using the Exploration Cost and Time Metric tool that was developed from a collaboration between government and industry. Looking for exploration techniques that might provide Structural Information? Thermal Information? This query has been included to allow you to use the black arrows in the table header cells to sort the table data. Acoustic Logs Downhole Techniques Well Log Techniques determine porosity of layers map discontinuities to determine their orientation. Active Seismic Techniques Geophysical Techniques Seismic Techniques Rock unit density influences elastic wave velocities. Structural geology- faults, folds, grabens, horst blocks, sedimentary layering, discontinuities, etc. Combining compressional and shear wave results can indicate the presence of fluid saturation in the formation. High temperatures and pressure impact the compressional and shear wave velocities. Cation Geothermometers Geochemical Techniques Geochemical Data Analysis Used to estimate reservoir temperatures. Compound and Elemental Analysis Lab Analysis Techniques Fluid Lab Analysis Results can aid in the determination of fluid source regions and circulation pathways. Certain elements exhibit high spatial correlation with high-temperature geothermal systems. Controlled Source Frequency-Domain Magnetics Geophysical Techniques Magnetic Techniques Locate geothermal groundwater and flow patterns. Core Analysis Lab Analysis Techniques Rock Lab Analysis Core analysis is done to define lithology. Core analysis can locate faults or fracture networks. Oriented core can give additional important information on anisotropy. Thermal conductivity can be measured from core samples. Core Holes Drilling Techniques Exploration Drilling Core holes are drilled to identify lithology and mineralization Retrieved samples can be used to identify fracture networks or faults Thermal conductivity measurements can be done on retrieved samples. Cross-Dipole Acoustic Log Downhole Techniques Well Log Techniques Rock stress and fracture analysis Use for fracture identification in open and cased holes. Also used for evaluating hydro fracturing/well stimulation effectiveness. Data Collection and Mapping Field Techniques Data Collection and Mapping Locates active faults in the area of interest. Map fault and fracture patterns, kinematic information Can reveal whether faults are circulating hydrothermal fluids. Map surface manifestations of geothermal systems. Identify and delineate shallow thermal anomalies. Map surface temperature. Density Log Downhole Techniques Well Log Techniques provides data on the bulk density of the rock surrounding the well Stratigraphic correlation between well bores. Porosity of the formations loggesd can be calculated for the Density log andprovide an indication potential aquifers. Development Drilling Drilling Techniques Development Drilling Identify lithology and mineralization, provide core samples and rock cuttings Retrieved samples can be used to identify stratigraphy and structural features such as fracture networks or faults -Water samples can be used for geochemical analysis -Fluid pressures can be used to estimate flow rates -Temperatures can be measured within the hole -Thermal conductivity measurements can be done on retrieved samples. Direct-Current Resistivity Survey Geophysical Techniques Electrical Techniques Rock type, mineral and clay content may be inferred. Determination of fracture zones, faults, depth to groundwater aquifers. Resistivity influenced by porosity, permeability, fluid saturation, fluid type and phase state of the pore water. Downhole Fluid Sampling Downhole Techniques Well Testing Techniques Water composition and source of fluids. Gas composition and source of fluids. Water temperature. Distinguish magmatic/mantle heat inputs. Can be used to estimate reservoir fluid temperatures. Drilling Techniques Drilling Techniques Identify lithology and mineralization, provide core samples and rock cuttings Retrieved samples can be used to identify stratigraphy and structural features such as fracture networks or faults -Water samples can be used for geochemical analysis -Fluid pressures can be used to estimate flow rates -Temperatures can be measured within the hole -Thermal conductivity measurements can be done on retrieved samples. Earth Tidal Analysis Downhole Techniques Well Testing Techniques Enables estimation of in-situ reservoir elastic parameters. Enables estimation of in-situ reservoir hydraulic parameters. Exploration Drilling Drilling Techniques Exploration Drilling Identify lithology and mineralization, provide core samples and rock cuttings Retrieved samples can be used to identify stratigraphy and structural features such as fracture networks or faults -Water samples can be used for geochemical analysis -Fluid pressures can be used to estimate flow rates -Temperatures can be measured within the hole -Thermal conductivity measurements can be done on retrieved samples. Field Mapping Field Techniques Data Collection and Mapping Map surface geology and hydrothermal alteration. Map fault and fracture patterns, kinematic information. Map surface manifestations of geothermal systems. Map surface temperature. Field Sampling Field Techniques Field Sampling Rock samples are used to define lithology. Field and lab analyses can be used to measure the chemical and isotopic constituents of rock samples. Can reveal relatively high permeability zones. Provides information about the time and environment which formed a particular geologic unit. Microscopic rock textures can be used to estimate the history of stress and strain, and/or faulting. Water composition and source of fluids. Isotope geochemistry can reveal fluid circulation of a geothermal system. Water temperature. Used to locate active hydrothermal systems. Thermal conductivity of a rock sample can provide information to calculate heat flow. Hydrothermal alteration of a rock sample can indicate certain temperature or fluid compositions. Field Techniques Field Techniques Locates active faults in the area of interest. Map fault and fracture patterns, kinematic information. Can reveal relatively high permeability zones. Provides information about the time and environment which formed a particular geologic unit. Microscopic rock textures can be used to estimate the history of stress and strain, and/or faulting. Can reveal whether faults are circulating hydrothermal fluids. Map surface manifestations of geothermal systems. Water composition and source of fluids. Isotope geochemistry can reveal fluid circulation of a geothermal system. Identify and delineate shallow thermal anomalies. Map surface temperature. Water temperature. Used to locate active hydrothermal systems. Thermal conductivity of a rock sample can provide information to calculate heat flow. Hydrothermal alteration of a rock sample can indicate certain temperature or fluid compositions. Flow Test Downhole Techniques Well Testing Techniques Flow tests provide information on permeability, recharge rates, reservoir pressures, fluid chemistry, and scaling. Flow tests can measure temperature variations with time to estimate characteristics about the heat source. Fluid Lab Analysis Lab Analysis Techniques Fluid Lab Analysis Results can aid in the determination of fluid source regions and circulation pathways, and assist in determining the degree of mixing between different hydrothermal fluids. Certain elements exhibit high spatial correlation with high-temperature geothermal systems; Isotopic ratios can be used to characterize and locate subsurface thermal anomalies. Frequency-Domain Electromagnetic Survey Geophysical Techniques Electrical Techniques Detection of high-conductivity bodies in the subsurface. Detection of the presence of a thermal anomaly through its resistivity signature. Gas Flux Sampling Field Techniques Field Sampling High flux can be indicative of conduits for fluid flow. Anomalous flux is associated with active hydrothermal activity. Gas Sampling Field Techniques Field Sampling High flux can be indicative of conduits for fluid flow. Gas composition and source of fluids. Anomalous flux is associated with active hydrothermal activity. Distinguish magmatic/mantle heat inputs. Can be used to estimate reservoir fluid temperatures. Ground Magnetics Geophysical Techniques Magnetic Techniques Presence of magnetic minerals such as magnetite. Mapping of basement structures, horst blocks, fault systems, fracture zones, dykes and intrusions. The circulation of hydrothermal fluid may impact the magnetic susceptibility of rocks. Groundwater Sampling Field Techniques Field Sampling Water composition and source of fluids. Determination of mixing ratios between different fluid end-members. Determination of fluid recharge rates and residence times. Water temperature. Hand-held X-Ray Fluorescence (XRF) Field Techniques Data Collection and Mapping Bulk and trace element analysis of rocks, minerals, and sediments. Isotopic Analysis- Fluid Lab Analysis Techniques Fluid Lab Analysis Water rock interaction Origin of hydrothermal fluids; Mixing of hydrothermal fluids Isotopic ratios can be used to characterize and locate subsurface thermal anomalies. Magnetic Techniques Geophysical Techniques Magnetic Techniques Presence of magnetic minerals such as magnetite. Mapping of basement structures, horst blocks, fault systems, fracture zones, dykes and intrusions. The circulation of hydrothermal fluid may impact the magnetic susceptibility of rocks. Microhole Array Drilling Techniques Exploration Drilling May be possible to assess fluid flow using small-diameter downhole tools designed for slim holes. May be possible to collect limited temperature data using small-diameter downhole tools designed for slim holes. Passive Seismic Techniques Geophysical Techniques Seismic Techniques Rock unit density influences elastic wave velocities. Structural geology- faults, folds, grabens, horst blocks, sedimentary layering, discontinuities, etc. Combining compressional and shear wave results can indicate the presence of fluid saturation in the formation. High temperatures and pressure impact the compressional and shear wave velocities. Reflection Survey Geophysical Techniques Seismic Techniques Rock unit density influences elastic wave velocities. Structural geology- faults, folds, grabens, horst blocks, sedimentary layering, discontinuities, etc. Combining compressional and shear wave results can indicate the presence of fluid saturation in the formation. High temperatures and pressure impact the compressional and shear wave velocities. Refraction Survey Geophysical Techniques Seismic Techniques Rock unit density influences elastic wave velocities. Can provide information on crustal thickness, depth to basement. Rock Density Lab Analysis Techniques Rock Lab Analysis Density of different lithologic units. Rock Lab Analysis Lab Analysis Techniques Rock Lab Analysis Core analysis can locate faults or fracture networks. Oriented core can give additional important information on anisotropy. Historic structure and deformation of land. Thermal conductivity can be measured from core samples. Rock Sampling Field Techniques Field Sampling Rock samples are used to define lithology. Field and lab analyses can be used to measure the chemical and isotopic constituents of rock samples. Provides information about the time and environment which formed a particular geologic unit. Microscopic rock textures can be used to estimate the history of stress and strain, and/or faulting. Isotope geochemistry can reveal fluid circulation of a geothermal system. Thermal conductivity of a rock sample can provide information to calculate heat flow. Hydrothermal alteration of a rock sample can indicate certain temperature or fluid compositions. Seismic Techniques Geophysical Techniques Seismic Techniques Rock unit density influences elastic wave velocities. Structural geology- faults, folds, grabens, horst blocks, sedimentary layering, discontinuities, etc. Combining compressional and shear wave results can indicate the presence of fluid saturation in the formation. High temperatures and pressure impact the compressional and shear wave velocities. Self Potential Geophysical Techniques Electrical Techniques SP technique originally applied to locating sulfide ore-bodies. Detection and tracing of faults. Determination of fluid flow patterns: electrochemical coupling processes due to variations in ionic concentrations, and electrokinetic coupling processes due to fluid flow in the subsurface. Location of near-surface thermal anomalies: thermoelectric coupling processes due to variations in temperature in the subsurface. Silica Geothermometers Geochemical Techniques Geochemical Data Analysis Used to estimate reservoir temperatures. Single-Well And Cross-Well Seismic Imaging Downhole Techniques Borehole Seismic Techniques Rock unit density influences elastic wave velocities. Structural geology- faults, folds, grabens, horst blocks, sedimentary layering, discontinuities, etc. Combining compressional and shear wave results can indicate the presence of fluid saturation in the formation. High temperatures and pressure impact the compressional and shear wave velocities. Soil Gas Sampling Field Techniques Field Sampling Identify concealed faults that act as conduits for hydrothermal fluids. Identify hydrothermal gases of magmatic origin. Differentiate between amagmatic or magmatic sources heat. -Permeability and porosity Determination of fluid flow patterns: electrochemical coupling processes due to variations in ionic concentrations, and electrokinetic coupling processes due to fluid flow in the subsurface. Location of thermal anomalies: thermoelectric coupling processes due to variations in temperature in the subsurface. Surface Gas Sampling Field Techniques Field Sampling Gas composition and source of fluids. Distinguish magmatic/mantle heat inputs. Can be used to estimate reservoir fluid temperatures. Teleseismic-Seismic Monitoring Geophysical Techniques Seismic Techniques Rock unit density influences elastic wave velocities. Map geothermal reservoir geometry. Structural geology- faults, folds, grabens, horst blocks, sedimentary layering, discontinuities, etc. Combining compressional and shear wave results can indicate the presence of fluid saturation in the formation. High temperatures and pressure impact the compressional and shear wave velocities. Time-Domain Electromagnetics Geophysical Techniques Electrical Techniques Detection of rock units or geological features with contrasting apparent resistivity. Structural information may be inferred from TDEM data. Hydrological information such as depth to groundwater table may be determined. Extent of hydrothermal alteration mineralogy may be inferred. Vertical Seismic Profiling Downhole Techniques Borehole Seismic Techniques Rock unit density influences elastic wave velocities. Structural geology- faults, folds, grabens, horst blocks, sedimentary layering, discontinuities, etc. Combining compressional and shear wave results can indicate the presence of fluid saturation in the formation. High temperatures and pressure impact the compressional and shear wave velocities. X-Ray Fluorescence (XRF) Lab Analysis Techniques Rock Lab Analysis Bulk and trace element analysis of rocks, minerals, and sediments. For information about regulations and permitting related to exploration for geothermal projects, see the Regulatory and Permitting Information Desktop Toolkit. ↑ 1.0 1.1 "[http://www.geo-energy.org/reports/Factors%20Affecting%20Cost%20of%20Geothermal%20Power%20Development%20-%20August%202005.pdf Annual US Geothermal Power Production and Development Report]"
↑ 2.0 2.1 2.2 "Developement of Metric for Measuring the Impact of RD&D Funding on GTO's Geothermal Exploration Goals"
↑ 3.0 3.1 3.2 "[http://www.geo-energy.org/reports/Factors%20Affecting%20Cost%20of%20Geothermal%20Power%20Development%20-%20August%202005.pdf Factors Affecting Costs of Geothermal Power Development]"
This page was last modified on 17 August 2018, at 13:54.